ABOVE: Early morning on the Krämerbrücke, an historic stone bridge lined with shops and houses. 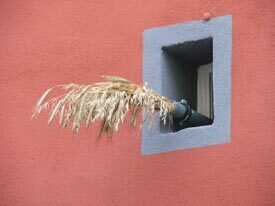 INSET: Grain in a "beer hole" announces that fresh beer is available within. Erfurt is the capital of Thuringia, which Martin Luther described as "in the center of the center" of Germany. It has a long history as a center of German religion and learning, with one of the oldest universities in Central Europe and a Catholic diocese that was founded in 742 AD. 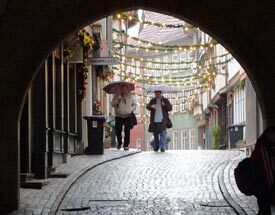 It has one of the most attractive medieval city centers in Germany, with patrician townhouses, half-timbered buildings, Europe's longest inhabited bridge, and enough churches to be called "The Rome of Thuringia." Erfurt is an attractive, lively city where you can easily linger for several days before heading for larger cities such as Dresden or Berlin. It's also a bit cheaper than the more heavily touristed cities of Germany, with hotels and restaurants that offer solid middle-class comfort at moderate prices.